There are three affordable ways your practice can utilize our program. Each option provides different modalities of engagement, speed, and ease of implementation. Get the step-by-step playbook and the entire All-Star 24-7 online SYSTEM to train not just your front office, but also your entire team in just 20 minutes a week with a 10X performance guarantee. Overcome the headache of implementation and start strong with our JumpStart on-site training visit. A coach will guide your team to LIVE master phone skills, overcome resistance to training, and set the right tone for your continued training. In addition to the JumpStart on-site visit, we will constructively hold you and your team accountable with 6 months of virtual coaching. We call our pragmatic approach to coaching “self-funding.” Expect the entire coaching experience to pay for itself within 90 days. Want To Learn More About All-Star Before Signing Up? Move beyond hard sales tactics that many “dental training” companies teach. Learn how small and simple changes yield a massive improvement to your bottom line. Grow your practice without hype or sales and feel good about what you do! Nearly every dentist I speak with loves the concept of All-Star Dental Academy. Who wouldn’t? 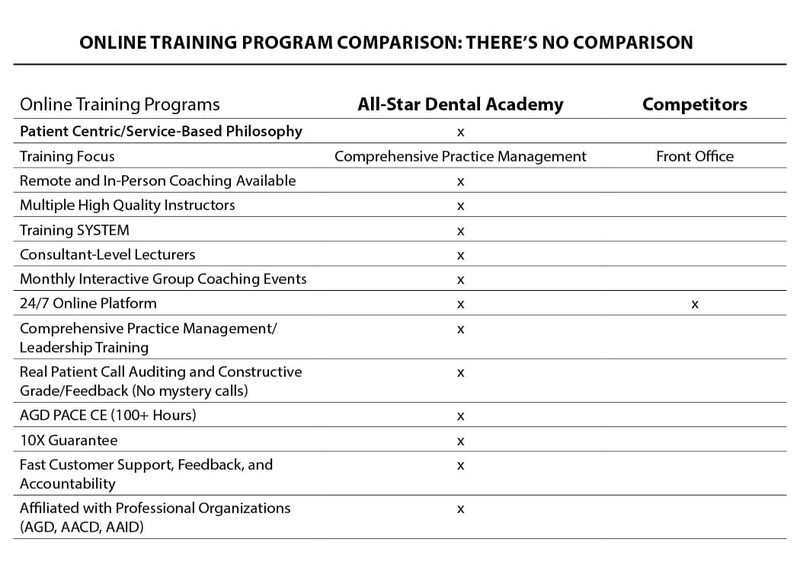 All-Star Dental Academy is dental phone and scheduling training with a customer-service-based approach, rather than sales. BUT… dentists have been burned by empty promises over the years. They ask me, “Are you for real? Or, are you going to constantly upsell me?” The answers are simple. Yes, we are for real, and no, we will not try to wring you dry. Answer: If you are committed and do the work, All-Star Dental Academy will help you. The concepts we teach come straight from the most successful Fortune 500 businesses. All-Star Dental Academy is about you and your success, and it is about the dental industry. There are companies out there in the dental community that “hard-sell” dentists and then have team members replicate these tactics on patients. This not only hurts the practice, but degrades the profession of dentistry. But you have a choice in how you relate to your patients. Choose to treat your patients with warmth and respect, and they will reward you with long-lasting and profitable business. Join today and let’s get to work achieving your goals! customize a program for you.